It’s not every week that I can say that I am a proud person — in fact, most of the time I feel like I’m cowering behind some sort of self-doubt or wishing that circumstances could have happened slightly more in my favor. But this week, there has been an accumulation of things that have left me brimming with pride. 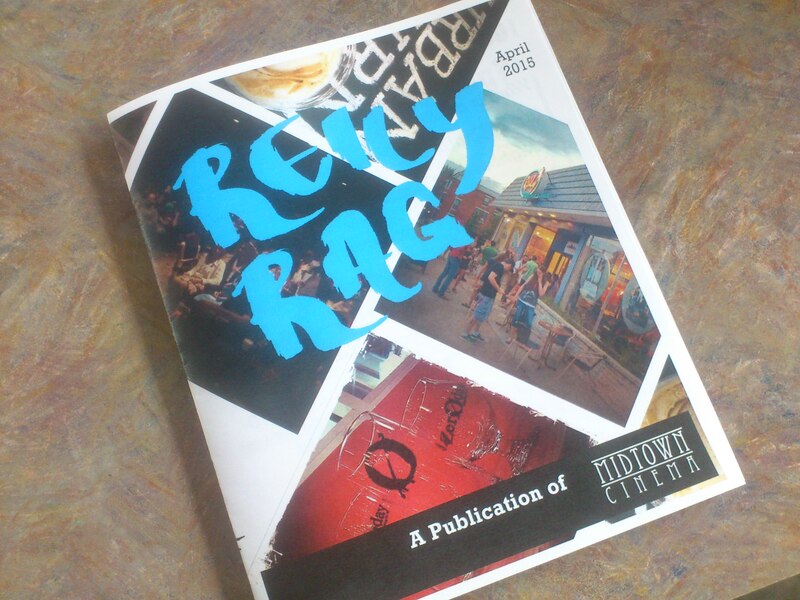 PRIDE POINT #1: Midtown Cinema is finally putting out its very first extensive newsletter, the “Reily Rag”. My coworker, Alex Holland, and I have made a little monthly booklet that announces upcoming events for the Reily Center (Midtown Cinema, Urban Churn, and Zeroday Brewing Company combined). We have slaved away at it (actually, since Alex did the graphic design, he did much more of the slaving — sorry, Alex), and it looks GREAT. The Cinema has been trying to figure out how in the world to incorporate all the various happenings of the Reily Center into one unified unit, and a monthly newsletter just seemed right. PRIDE POINT #2: The HIT celebrates its one-year anniversary. In the spring of 2013, two of my housemates at the time decided they were going to take a long-form improv class, taught by Paul Barker, and asked me to join them. My knowledge of improvisation was limited, but there had been one long-form show that I had seen about a year prior in LA that had blown my mind; that show, coupled with a desire to bond with my housemates, made me jump heartily onto that bandwagon. Paul, whose qualifications honestly meant absolutely nothing to me at the time (UCB, Magnet Theater, etc.) was a fantastic teacher, and my curiosity quickly turned into excitement for an art that I wish I had discovered earlier. There was a gap between that first class and my continuation with improv; but then Paul teamed up with Jake and Somers Compton to start Harrisburg Improv Theatre, and the rest was history. In a frenzy of new classes and house team performances, the HIT solidified my love of improv, and thrust me into a sea of new friends and acquaintances who shared the same passion. And now, the one-year anniversary of the theatre is creeping up, and I’m so stoked. I know I can’t claim ownership of the accomplishment of this place, but I can claim pride in watching it grow — I’m like that annoying aunt that suddenly is super available to hang out when the baby is born, and isn’t very good with babies but makes faces at it and loves it and starts to tear up when old photos are brought out. PRIDE POINT #3: My sister, Becky, has finally spoken with a deaf person in Romania. Becky moved to Romania a few weeks ago to work with an organization that is working to translate the Bible into — not Romanian — Romanian sign language. This is already a pretty crazy concept, made even crazier by the fact that she is not yet fluent in either Romanian or Romanian sign. Of course, she is well on her way to change that; even before she moved, she was taking Romanian language courses. But the thing is, she can’t really start speaking in sign until she has a better handle on the spoken language — otherwise when she doesn’t know a word in sign, the deaf people she’s talking with may try to spell it out… in Romanian. See the problem? So I guess it makes sense to learn the spoken language first… but it’s frustrating. She moved halfway around the world because of a passion for communication with the deaf. But she has to wait. To me, this was a hell-yeah moment: it didn’t matter that Becky lacked the skills to speak to this woman in her native tongue (hand?) — when the opportunity arose, she was able to surpass the language barrier and communicate with a person who she had literally circled the globe to communicate with. Talk about fate. See how much I have to be proud of? With a negative connotation, pride refers to an inflated sense of one’s personal status or accomplishments, often used synonymously with hubris. With a positive connotation, pride refers to a satisfied sense of attachment toward one’s own or another’s choices and actions, or toward a whole group of people, and is a product of praise, independent self-reflection, or a fulfilled feeling of belonging. I love, love, love the last bit. When speaking of the positive connotation, pride is a feeling that we have when we spend time with a person or a group of people that we love or feel comfortable with. I especially love the order of factors in the production of pride: 1) someone praises you for something, 2) you reflect on that praise and find it to be true, and 3) you feel content because that part of you has been recognized by someone whose opinion you value. If anybody needed any further proof that human beings are social creatures, I have found it in a Wikipedia article. Or, in cases which it isn’t you that is the source of your pride, but the group of people you are connected with, then it just skips straight to that feeling of belonging: someone you love has done something great, and then you can be the one who praises them. The things I am proud of this week reflect this concept. 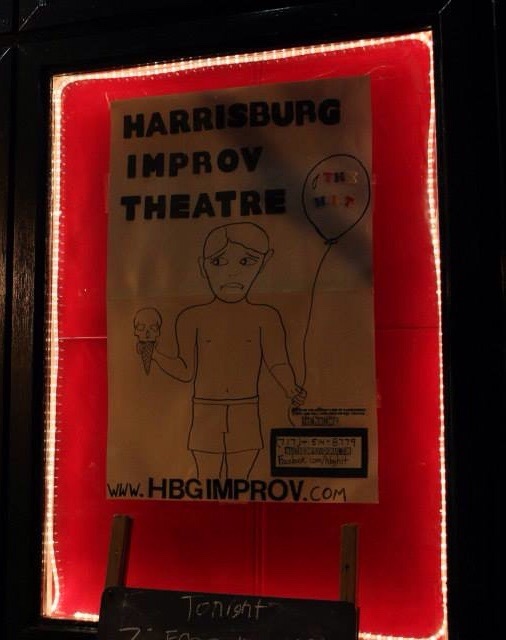 I am proud to be a part of the Harrisburg improv community; I am proud to be a productive part of the Midtown Cinema community; and I am proud to be related to my sister, Becky. There. Nothing at this moment could make me more content.